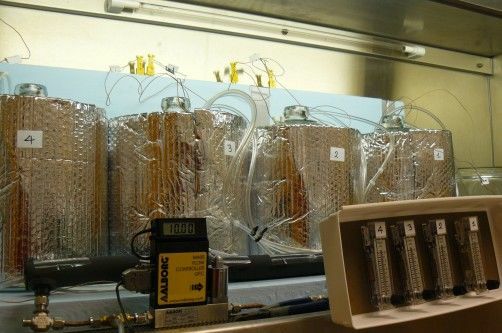 Researchers tested lab-scale aerobic digestions using tanks containing chicken carcasses, water and low levels of oxygen. Further research may test the concepts at field scale. Iowa State University researchers have completed testing of a key component of a new concept for disposing of animal carcasses following a disease outbreak. The research someday may help producers facing animal disease emergencies, such as in 2015 when avian influenza resulted in disposal of millions of chickens and turkeys in Iowa and other states. Jacek Koziel, associate professor of agricultural and biosystems engineering, said animal health emergencies occur around the globe each year due, not only to disease, but also to hurricanes, flooding, fire and blizzards. These incidents often require the disposal of numerous animal carcasses, usually accomplished via burial. In research published recently in the scientific journal Waste Management, Koziel and his team analyzed a method that could help livestock, poultry and egg producers deal more efficiently and safely with crises that lead to sudden increases in animal mortality. Koziel and his team focused their research on improving on-farm burial, the method most commonly employed for large-scale carcass disposal due to its low cost and ability to quickly reduce the spread of airborne disease and foul odors. But emergency burial can contaminate nearby water resources with chemical and biological pollutants, and many locations in Iowa are considered unsuitable for such practices by the Iowa Department of Natural Resources. Buried carcasses also decay slowly, sometimes delaying use of burial sites for crop production and other uses for years, Koziel said. To overcome these problems, the researchers studied a hybrid disposal concept conceived at the National Institute of Animal Science in South Korea following a massive outbreak of foot-and-mouth disease in 2011. The method combines burial with aerobic digestion, a method commonly used for treating sewage in which air is pumped through the content to speed decomposition. The experiment also included burial trenches lined with flexible geomembranes like those used to prevent seepage from landfills and wastewater treatment ponds to protect water quality. The researchers then injected low levels of air into the bottom of the trench to accelerate carcass decomposition and treat the resulting liquid contaminants. The experiment tested the performance of the aerobic component of the hybrid method in a lab using tanks containing whole chicken carcasses, water, and low levels of oxygen that occasionally dropped to zero as would be likely in emergency burial trenches. Results of the study showed low levels of oxygen accelerated carcass decay significantly, reducing carcass mass by 95 percent within 13 weeks, while similar tests without air produced no noticeable decay. The air and water used for the experimental method create an ideal environment for bacteria to break down the carcasses quickly, a “shark tank,” as Koziel described it. Chemical contamination in the liquid waste met U.S. Environmental Protection Agency criteria for safe discharge to surface waters. The hybrid method also eliminated two common poultry pathogens, salmonella and staphylococcus. Aeration also reduced odorous gases sometimes associated with mass burial. Koziel said the encouraging laboratory results could pave the way for follow-up field studies that will include evaluation of alternative geomembrane liners, aeration system designs and components, and performance testing of the complete hybrid disposal system. The research was supported by funding from the Korean Rural Development Administration.